The eclectic nonprofit record label Little Village Foundation, which exists to shine a light on underground artists in and near California, has found its voice. 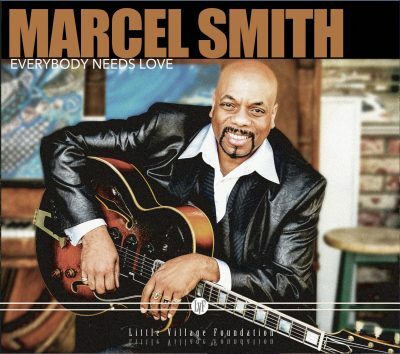 From a young age, Marcel Smith’s dynamic vocals—transitioning from smooth, tender and soulful to raw and feverishly uplifting in short order—have electrified churchgoers for years with undeniable conviction and passion. Willie Washington knew he was on to something special. The seasoned quartet gospel great discovered the 15-year-old Smith as the boy was belting out a solo in his own house of worship. Soon after, Smith was singing and playing guitar with Washington’s WD Gospel Singers. Smith held his own and then some, going on to share concert bills with some of the genre’s foremost talents. Everybody Needs Love is Smith’s solo debut album, and it’s a perfect fit for Little Village Foundation, which features records from the likes of youth ensemble Mariachi Mestizo and Aki “The Only Bombay Blues Man” Kumar. A slew of other releases from the imprint are expected to drop in August, as well. The variety of musical styles is remarkable. As for Everybody Needs Love, Smith describes its contents as “inspirational music.” Gospel is well-represented, though, as Smith and company shake the rafters with a spirited, swinging romp through the old religious standard “What A Friend” that perspires profusely. It feels like an awakening, while their simply incandescent version of “This Little Light of Mine” is child-like in its hopefulness and purity. Smith’s social consciousness emerges in a rather sad and wistful remake of Bobby Womack’s “Harry Hippie” that, for all its good intentions, darkens the soul, as a heartfelt “Poor Man’s Struggle” sympathizes with the downtrodden. Lighter fare, such as a cover of Sam Cooke’s “Keep Moving On,” where Smith croons softly and confidently to swaying, sparkling instrumentation, keeps Everybody Needs Love from getting too weighed down with heavy emotions. Loose and relaxed, the song features a vocal turn by Wee Willie Walker, and it has a good-natured vibe. On the other hand, Smith’s prayerful reading of “He Ain’t Heavy, He’s My Brother” is, for all of its melodic beauty, saturated with melancholy.